"This years elite retreat at Bohemian Grove is fast approaching. Many of the Grove’s guests will be flying into Santa Rosa Airport on the 10th of July, a Friday. They will travel West towards a small town called Monte Rio via highway 116, or River Road to discuss events and policy in private. In the spirit of past rallies and protests organized by the Bohemian Grove Action Network, 9/11 Truth and anti-globalization activists will maintain a presence at the Grove. This is the first weekend of the retreat and they will be performing their Cremation of Care ceremony. I must mention that while the elite are here meeting privately, our focus is what the elite do outside the Grove. Anyone who is interested in joining is welcome. The issue at hand is corporate control of us individually and as a Government. Stand with us against policy makers that come to the Grove to escape and meet in private. Yearly guests to the Grove include: David Rockefeller Sr. and Jr., Henry Kissinger, George H.W. Bush, Paul Pelosi, Colin Powell, Walter Cronkite, Kenneth Starr, James Woolsey, Donald Rumsfeld, Riley Bechtel of Bechtel Corp., and so many more. As you can see, the people coming to Sonoma County are from the corporate, banking, military, intelligence, and media complexes." The Press Democrat was kind enough to cover not only the gathering this weekend, but also give a quick shout out to our current protest, as well as the long history of protests maintained by the Mary Moore and the Grove Action Network over the years. 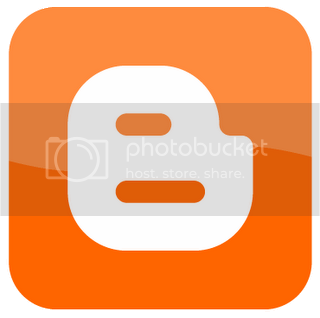 That article can be viewed here. 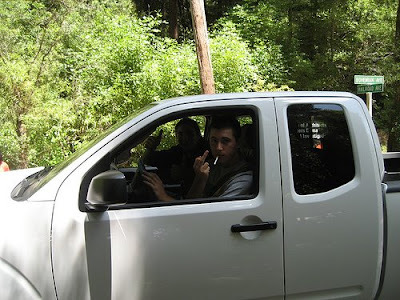 Thanks to everyone who came out and supported the first of two planned protests at the Bohemian Grove, 2009. A couple of people from the Bohemian Grove Action Network came out for the first time in quite a few years to re-activate with us. 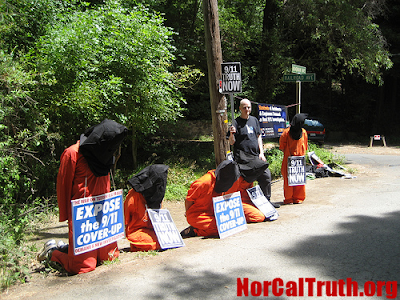 Nor Cal Truth was joined by activist’s from Marin, Vallejo, and San Francisco. A few middle fingers were given to us by the entering/exiting guests, but surprisingly, more positive support was show for our demonstration. Linking 9/11 with the crimes against humanity known and war and torture created a solemn space with a powerful message outside this secretive facility. 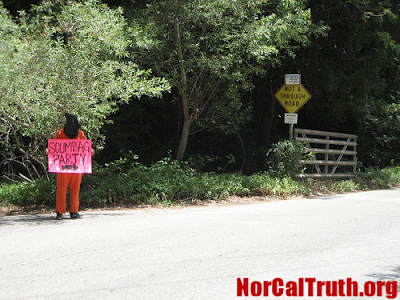 Orange jumpsuits were donated from the Bay Area's World Can't Wait chapter and stress positions were held in solidarity with victims of the fraudulent War on Terror. These guys are undecided on their support. 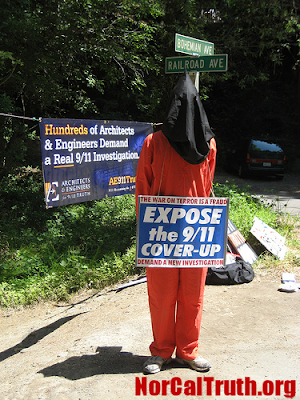 Luckily, we were able to pass out a few fliers and DVDs relating to various topics about 9/11, corporate war-profiteering and creeping fascism in America. 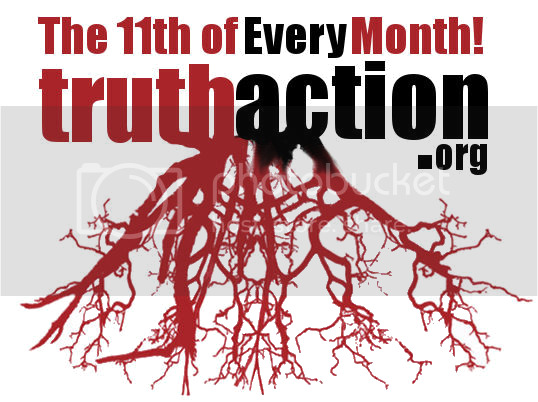 Our event also coincided with the ongoing, international Eleventh of Every Month Campaign for 9/11 Truth and Justice. Other members of our group were able to create a presence in downtown San Francisco simultaneous with the Bohemian Grove action, distributing truth materials and engaging with the public in discussion. -Previous coverage of Bohemian Grove protests can be viewed here. 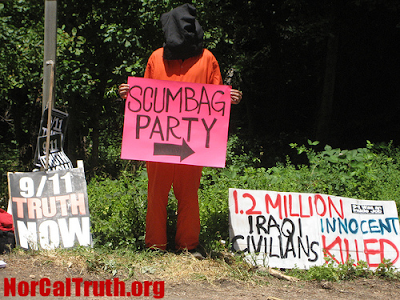 -Incoming July 11th Actions for 9/11 Truth and Justice can be viewed here. As well as more pics from today's actions. VeilLifter on Sun, 07/12/2009 - 8:03pm. snowflake on Mon, 07/13/2009 - 10:51pm.